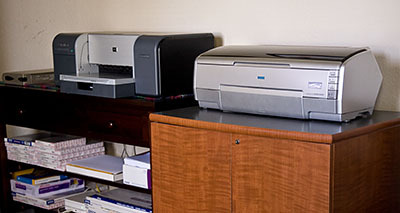 Multiple printers are easier to manage on a network than trying to connect them directly to your computer, or tougher yet, multiple computers. You can set up a network without spending too much. Basically you need a wireless access point, such as an Apple Airport Extreme, and a good USB hub. For my printer hub, I went with the Belkin Mac Mini USB 2.0 4PT Hub because it has the same footprint as the wireless base station (as you can see in the photo, hub is on the bottom). Of course, when you estimate a job like this, you say to yourself, "two, maybe three hours." Listen to the podcast to see what happened in my case. Paper is this month's photo assignment. Writing paper, wallpaper, bathroom sheets, doctor's office, paper pushers, paper airplanes... lots of possibilities for this one. You can read more about how to submit on our Submissions page. Deadline for entry is March 31. Check out what you can do with an $150 underwater housing and a compact point and shoot by taking a look at my underwater gallery from the Caribbean. Lowepro Bags for Photographers On the Go -- Lowepro gear for every type of camera rig, every type of photographer. are the podcasts a thing of the past? In Belkin's defense, I think the hub you describe was initially targeted to go with the Mac mini. 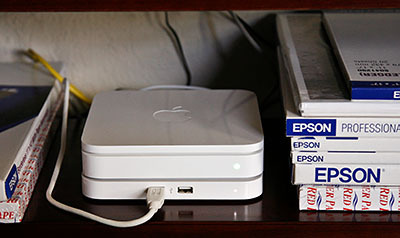 On the mini, the USB connection is on the left side instead of being on the right side on the Airport Extreme base station. I am interested in your back-up plan. I am curious how well the USB connection will work. I would guess that using an wired Ethernet connection into the Airport base station might be more reliable, since you share the USB connection with the several printers. Looking forward to the next installment of your networking saga.